Arthur Williams (February 24, 1934 – February 8, 1979) was a professional baseball umpire who worked in the National League (NL) from 1972 to 1977, and was the first African-American umpire in the NL, wearing number 25 during his career. Williams umpired 806 Major League Baseball (MLB) games in his six-year career. He also umpired in the 1975 National League Championship Series. 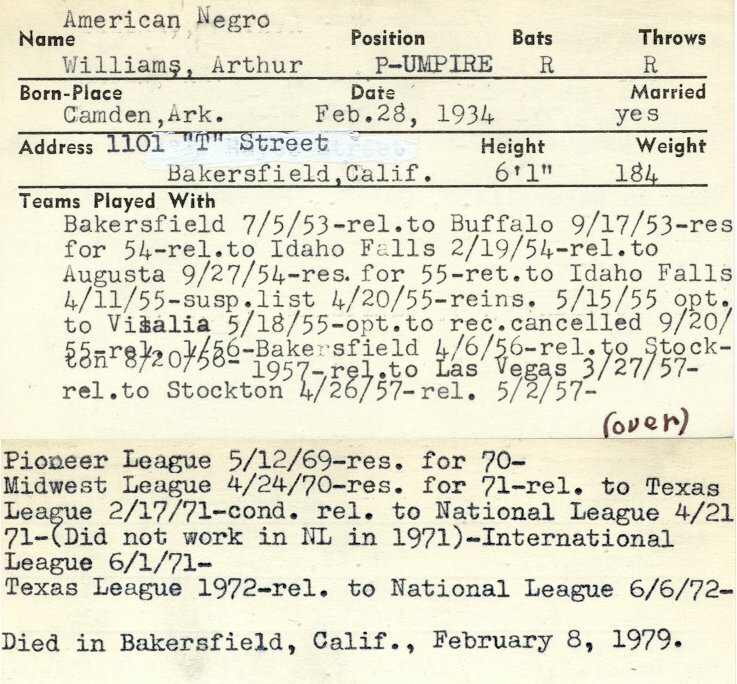 Art Williams had pitched high school baseball in Bakersfield, California. He entered minor league baseball, but suffered a career-ending elbow injury. He was umpiring local recreational baseball in Bakersfield when a former scout for the San Francisco Giants encouraged him to attend umpire school. He attended umpire school in 1969 and then began umpiring in the minor leagues. In 1972, Williams became the first black umpire in the NL. After working as a reserve umpire that year, Williams was promoted to the NL full-time in 1973. He was assigned to the postseason once, working the 1975 National League Championship Series. He was fired after the 1977 season, having worked 806 games in six MLB seasons. He remained the only black NL umpire in his last season. At a hearing a few months after his firing, he claimed that his dismissal may have been motivated by racism. He said that, with the planned promotion of umpire Eric Gregg, the league did not want to accommodate two black umpires among its ranks. A complaint with the Equal Employment Opportunity Commission was still pending at the time of his death. Williams drove a bus in Bakersfield until he suffered a seizure in the fall of 1978. He underwent brain surgery and was in a coma for six weeks until his death on February 8, 1979. ^ "Williams May Become First Black Umpire in National League". Daytona Beach Morning Journal. March 20, 1971. Retrieved February 10, 2013. ^ "National League Signs Black Umpire Williams". Baltimore Afro-American. March 27, 1973. Retrieved February 10, 2013. ^ "Umpire Alleges Racism". The Milwaukee Journal. February 15, 1978. Retrieved February 10, 2013. ^ "Umpire Ashford Calls 'Em Just as He Sees 'Em". Daily News. May 9, 1978. Retrieved February 10, 2013. ^ a b "Art Williams". Toledo Blade. February 8, 1979. Retrieved February 10, 2013. This page is based on the Wikipedia article Art Williams (umpire); it is used under the Creative Commons Attribution-ShareAlike 3.0 Unported License (CC-BY-SA). You may redistribute it, verbatim or modified, providing that you comply with the terms of the CC-BY-SA.